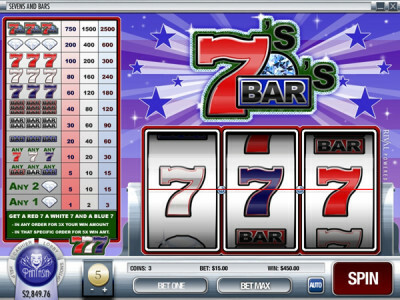 A classic design for an online slot machine, Sevens and Bars provides old-time slot machine fun and excitement to the player. The simple three-reel design and layout is complemented by a high number of different symbols on the reels. The amount of symbols helps keep the game from being boring and repetitive, and encourages players to stay and try their luck for a few more spins. Sevens and Bars slots also has a wide selection of betting options. The reels can be spun for a single cent, or all the way up to fifteen dollars. Sevens and Bars logo: The top symbol. When three of them are on the single pay line, up to 2500 coins are paid out. Diamonds: Three of them will pay out up to 600 coins. Sevens: Three in red, white or blue win 300, 240, and 180 coins respectively. Three Sevens Any color: triple the win amount. Bars: Single, double, or triple Bars increase win value. 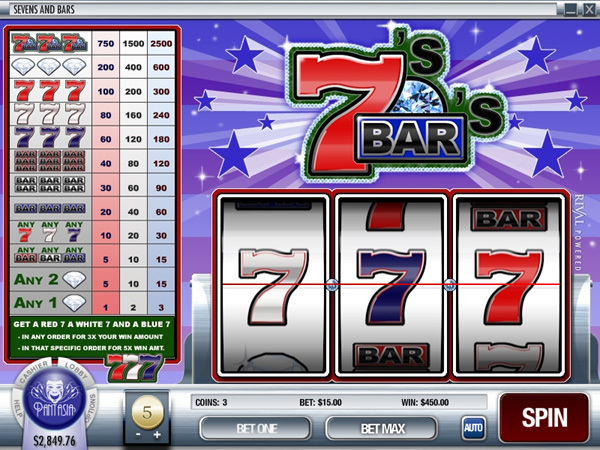 For all the old-school entertainment that Sevens and Bars brings, it is definitely a slot that deserves to be played. Spin up some sevens and bars for fun and payouts; you will be glad you did.